Teaser: Gabrielle confronts her father about the disturbing vision she saw in his Bowl of Divination which sends Xena and her on an unexpected journey. Gabrielle knew she had put this off long enough. She knew she needed to speak with her father about the vision that she’d seen in his bowl when she’d first arrived on Olympus. She just wasn’t sure she really wanted to know the answer… and she was afraid of what Xena would think. So after a romantic evening Gabrielle had left her wife sleeping in the chambers they were currently sharing on Olympus, which is why she now found herself alone, striding towards the Great Hall. As she approached the doors she took a deep breath and steeled her nerves for the conversation to come. She quietly pushed open one gilded door, half hoping to find Apollo absent. Fortunately, or unfortunately, she saw her father in his customary place gazing into the bowl. Gabrielle sighed. “I guess there’s no getting out of it this time,” she muttered. Squaring her shoulders she entered the Great Hall. Crossing the marble floor she called out, “Hello… father.” She still wasn’t used to thinking of Apollo and Aphrodite as her parents. Apollo held up one hand acknowledging his daughter’s greeting, but his gaze remained firmly fixed on the Bowl of Divination. Finally he shook his head and turned to face his daughter. “Hello,” he said with a smile, holding out his arms for a hug. Gabrielle returned his embrace. She couldn’t help feeling drawn to this charismatic man who was her father. She could feel the love he had for her and wanted to return it, but she just wasn’t able to yet. After all, she hardly knew the man. Stepping back she asked, “So, what was that all about?” She gave a slight jerk of her head towards the bowl. “Did you see… our deaths?” Gabrielle asked. Apollo looked at her expectantly. He wanted to know what his daughter was thinking, but sensed that she would have to go at her own pace. “This,” answered Gabrielle pointing at a stand holding a gilded bowl; a bowl which the petite blonde would have difficulty wrapping her arms around. “I think this is Apollo’s Bowl of Divination,” she said placing a hand on the rim of the bowl. As she did so, a ripple raced across the surface of the water and Gabrielle began to see images. She stood still, hardly daring to breath as the images danced across the liquid. Gabrielle’s eyes widened as she gazed into the bowl before her. The scene resolved itself into a well appointed room. Stone walls and marble floors were softened by sedate wall hangings and throw rugs giving the palatial room more of a homey feel. She could see a figure reclining on the bed, but it was obscured from view by a sheer curtain. The focus changed and Gabrielle could now see that the figure on the bed was her. When she took a second look she realized that the Gabrielle in the vision was nursing a golden haired newborn. The water rippled again and the image changed. Now she could see herself rocking in front of a roaring fireplace, smiling as she watched a small golden haired girl and a raven haired boy wrestling on the floor with Xena. The scene changed yet again with more rippling of the water. This time she could see herself and Xena sitting on a grassy embankment beside a gurgling stream. There was a picnic spread out before them. As Gabrielle watched, a breathless Eve ran into view and flopped down beside Xena. She was followed by a half-dozen children ranging in age from toddlers to young teens. The scene clouded over and no more images were forthcoming. “Oh,” Gabrielle said, a little startled. “I hadn’t really thought about that. I guess you would be their grandfather.” She smiled up at the man who was trying so hard to make up for being an absent father. As soon as Gabrielle’s hand touched the Bowl the water rippled and a scene slowly began to form. This one was sluggish and out of focus. At first all she could make out were two figures sitting on a hillside. As the focus became a little clearer, Gabrielle was able to see that they were two blonde youths. They were laughing and joking around with each other. When the scene finally resolved itself, Gabrielle was startled to discover that the two teens in the vision were Solan and… Hope. “But that’s not possible,” Gabrielle said with a shudder. Gabrielle did as instructed. This time the images took shape much more quickly, though not as fast as those of her and Xena with their future children. To her untrained eye the vision appeared unchanged, but before she could remove her hand the water rippled. This time she saw herself and Xena sitting at the dinner table with two small children. She smiled at the image, intensely glad that there were happy times ahead for her and Xena. As she continued to watch a door opened and in walked Hope and Solan. They crossed the room, hand in hand. As they neared Gabrielle could see it was Hope, but it wasn’t Hope as she knew her. She was… changed in small ways. No longer a carbon copy of Gabrielle, but still very much her daughter. When the two reached the table Solan pulled out Hope’s chair for her. She reached up and kissed Solan lightly on the cheek before sitting to join the rest of the family at the table. Gabrielle’s hand rose to cover her mouth and the vision was lost. “That is strange. Perhaps we should look for the trigger point,” Apollo mused. Gabrielle agreed and they spent the better part of the next candlemark looking for the trigger point. They couldn’t be certain that they had found the exact point because it was completely shrouded. They couldn’t see a thing, but everything pointed to this one specific spot. “I don’t know Father. I’m still pretty uneasy about this,” Gabrielle said. “When are you going to tell Xena?” Apollo asked. “Tell me what?” Xena asked as she crossed the Great Hall toward the pair. When she reached Gabrielle she embraced her and gave her a quick kiss. The arbor on Mt. Olympus was beautiful. Stately old trees interspersed with younger ones. Bushes and flowers arranged in natural seeming patterns. Gabrielle and Xena sat together on a rock outcropping at the base of a large waterfall. Gabrielle kissed her partner before turning and walking back to the palace. Gabrielle wasn’t really paying attention to where her feet were taking her, but she wasn’t surprised when she found herself outside her mother’s rooms. She politely knocked on the door and waited for Aphrodite to let her in. “Not exactly.” Gabrielle’s voice waivered and before she knew it the floodgates had been opened, tears streaming down her face. She felt Aphrodite’s arms encircle her. “There, there sweet pea. Everything will be alright.” Aphrodite led them over to a plush sofa where she continued to comfort her daughter. When she could once again speak Gabrielle haltingly told Aphrodite what was wrong. Aphrodite listened calmly without interrupting, which was very difficult for her. Xena slowly made her way through the halls of Olympus. She still had mixed feelings about Gabrielle’s vision, but she knew that wasn’t Gabrielle’s fault. She wanted to ask some more questions before she came to any decisions. She had just raised her hand to knock on Aphrodite’s half open door when she heard Gabrielle’s voice inside. Pausing she listened to her soulmate’s distraught words. “I do,” Xena said as she crossed the room and enveloped Gabrielle in a tender hug. Stroking the younger woman’s hair she said, “I know you wouldn’t do that, and I love you all the more because of it.” Xena and Gabrielle remained in each other’s arms, awash in memories of their children. “How do you know that Apollo?” asked Xena. “What is so different about this vision from the one that you saw about me?” she asked, referring to his vision so long ago of her becoming the destroyer of nations. “The first time it was like that, but the second time…” Gabrielle started. “What do you mean?” Xena asked. “So, my son’s life could be restored?” Xena asked, a glimmer of excitement showing in her normally stoic features. “I… think I’d like that,” Xena said. “But I’m not sure it’s a good idea.” Xena’s shoulders slumped in defeat. “Xena, you ‘gave up’ Solan to protect him! A bad mother wouldn’t have cared if he was a target for her enemies. And as for Eve, well that wasn’t your fault. We faked our deaths to protect her. Neither one of us had any way to know that Ares would interfere. I know you were a good mother to them, just as I know you’ll be a good mother to this child.” Gabrielle placed a hand over her still flat stomach. “Thank you,” Xena said, simply. She felt a knot in her chest loosen. Xena stared at Gabrielle’s hand for a long moment before grasping it firmly in her own. Xena and Gabrielle materialized inside a cavernous antechamber. A long line of bewildered individuals snaked around the perimeter of the room and down a long tunnel. They were all waiting for passage in a small narrow boat across a subterranean river. Not bothering with the line, Xena and Gabrielle approached the boatman as he pulled his craft ashore. He crossed his arms over his chest. “Two dinars… each,” he stated firmly. Xena made a move as if to throttle him, but Gabrielle stopped her with a touch to the other woman’s arm. Making sure she had Charon’s full attention Gabrielle said, “Two dinars.” Two gold coins appeared in her outstretched palm. “Each.” Two more coins clattered onto the first. Charon’s eyes grew wide as they darted from one woman to the next. “Step right this way, ladies,” he gestured with a sweep of his arm. Xena and Gabrielle stepped into the boat. When the next person in line tried to follow them, Charon barred their way. “Wait your turn. VIPs here.” He shoved off and they began to cross the river. The craft reached the far shore and Xena stepped out, holding out her hand for Gabrielle. Passing through the arch they heard a humming and saw the mouths of three tunnels open before them. Knowing that Solan was in the Elysian Fields they chose the right branch. There was a slight incline to the tunnel floor and it gradually brightened until it finally opened into a beautiful field. To one side they could see a huge waterfall emptying into a crystal clear lake. Everywhere they looked were smiling people in flowing white robes. “And you, Daughter,” Herodotus replied. “Stop that,” Gabrielle scolded, bumping his shoulder with her own. Perdicus laughed and they rejoined the others. ”We know, Xena,” Heroditus said. “Take care of each other,” he added with a stern glance at Xena. Xena and Gabrielle resumed their search for Solan. They’d made it about half way around the lake when they were hailed once again. They turned towards the voice and Xena’s face lit up like a school girl’s. “Mother! Lyceus!” She ran to greet them and Lyceus swept her up into a hug and swung her around in a circle. “It’s good to see you too, sis!” he said before finally setting Xena back on her feet. “Daughter,” Cyrene said, opening her arms to receive Xena’s enthusiastic embrace. Gabrielle hung back, not wanting to interrupt the family reunion. Noticing her reticence, Lyceus walked over to Gabrielle. “It’s good to finally meet you,” he said, holding out a hand. She grasped the hand and was surprised when he pulled her into a hug. “Me too,” he answered. “Xena talks to me quite a bit, and a lot of the time it’s about you.” He winked at her. “Hey! That’s my wife you’re mauling,” Xena teased her brother. She was pleased, though, that they were getting along. Lyceus let out a whoop. “Way to go sis!” he said as he clapped Xena’s shoulder. “Thanks,” Xena said, puffing up like a peacock. “I know you two will make wonderful parents,” Cyrene chimed in. “Thank you. That means a lot,” Gabrielle told her earnestly. “Thanks mom,” the younger women said in unison. 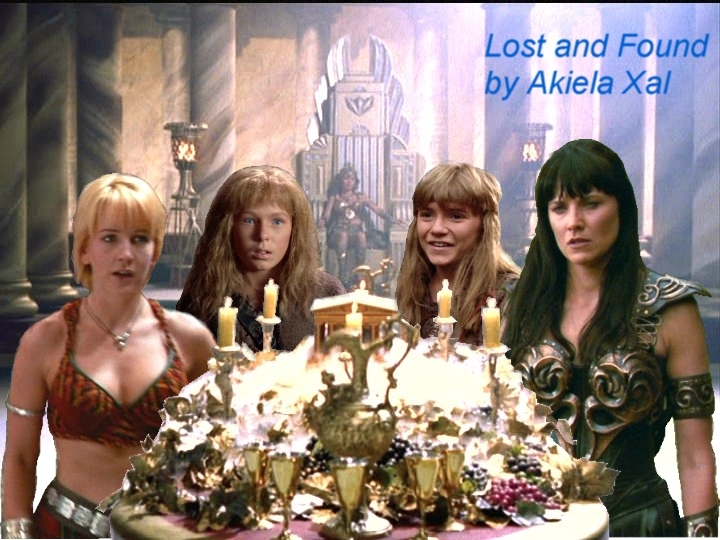 Xena and Gabrielle continued their search for the missing Solan. When they didn’t find him in the remainder of the Elysian Fields they decided to move on to Tartarus. Both knew from experience that it was a dark and dreary place – one that neither of them really wanted to revisit, but just the sort of place a twelve year-old-boy might enjoy. “Did I hear someone mention my name?” A tall, handsome dark-skinned man approached from behind them. Xena turned around and recognition flashed in her eyes. “Marcus!” She pulled him into a fierce hug. “That sounds like Solan,” Gabrielle said, lightly placing her hand on Xena’s arm. “That tends to happen as we get older,” she replied drolly, eliciting a chuckle from Marcus. “Xena.” Gabrielle shook her head in bemusement. “It’s spring topside. That means Persephone’s with her mother, not here.” Gabrielle turned the knob and the heavy door swung open easily on well-oiled hinges. “Where to?” she asked. “Where?” Xena huffed in frustration. “We haven’t tried the Asphodel Meadows yet,” Gabrielle replied. Wandering around the nearly treeless plain, Xena and Gabrielle could immediately see the difference between the Asphodel Meadows and the Elysian Fields. The Meadows weren’t barren by any means, but they weren’t entirely pleasant either. The voice from behind them made Xena stop in her tracks and Gabrielle could see the other woman visibly shiver at the sound. Turning around slowly Xena said, “Hello, Borias.” Her face showed a mixture of emotions, as though Xena couldn’t decide if she were happy or frightened at running into her old lover. “Limbo?” the two women chorused. “I’ve never heard of Limbo,” Gabrielle said, puzzled. “What’s that supposed to mean?” Xena asked, exasperated. Borias smiled enigmatically. “Come. It will be easier to show you.” He led them across the Meadows. They crossed an invisible barrier and found themselves in a vast, dark expanse, broken by irregularly spaced circles of light. “What is this place?” Gabrielle asked. “What’s with those lights?” Xena asked. Within the circle of light the trio could see a man suspended in mid-air over crashing ocean waves. Lying on a small rock outcrop just out of reach was a trident. “It is,” Borias replied nonchalantly. “This is how really looks. The water was just for show.” As Borias resumed walking, he explained, “Limbo is the place where dead gods end up. Since they’re not truly mortal, they can’t spend their afterlife with the rest of us. Limbo is its own kind of torment…” Borias trailed off as he realized that Xena was no longer with them. Looking back the way they’d come, they saw Xena standing beside one of the circles of light. They retraced their steps and watched as Xena took a hesitant step through the barrier. Gabrielle made a move as if to follow her soulmate, but Borias stopped her with a gentle hand on her wrist. “No, Gabrielle, this is something she must do alone.” Gabrielle turned and watched helplessly as Xena confronted the person imprisoned within this sphere. Not knowing what she intended to do Xena crossed the threshold from the rest of Limbo into this personal nightmare. She found herself in an exact duplicate of the Great Hall of Olympus. Bound to the replica of Zeus’ throne, Xena could just make out the figure of Athena, seemingly oblivious to her surroundings. In life Athena had coveted the power the throne represented. Now she had the throne with absolutely no power. Xena just stared at the woman before her. The woman who had almost cost her so much. Xena wanted to hate Athena, but somehow seeing her trussed up like a pig for slaughter began to melt that hatred. It didn’t seem as though Athena would respond, then she blinked as though coming out of a trance and her head slowly turned in Xena’s direction. “What?” she croaked, voice rough with disuse. “What? What can you possibly say?” Xena shook her head. “Look at you, you’re pathetic.” Xena spun away. In the blink of an eye Xena’s chakram was out and speeding straight for Athena. At the last second the chakram split in two and sliced through Athena’s bonds before ricocheting off marble columns on either side of the throne and winging their way back toward Xena. The two pieces rejoined in mid-air, with Xena easily catching the once more whole chakram. “I doubt you’ll be able to escape your prison, but at least you won’t be bound to that throne anymore,” Xena said. She turned and strode purposefully toward the spot where she knew the boundary to be. Without pausing, Xena replied, “Because… I forgive you… mother.” And with that Xena exited Athena’s prison where she found Gabrielle waiting with open arms. She fell into the embrace. They just stood there for several minutes, neither needing to say anything. “I never thought that she…” Gabrielle shrugged. “You will see,” Borias replied enigmatically before leading the way deeper into Limbo. Both women gave him a hug and proceeded toward the sphere. As they drew closer, the contents of the sphere began to take on definition. They could see a stone chamber that looked vaguely familiar. A figure lay upon a stone altar with a second figure sitting comfortably on the altar beside the first, legs swinging back and forth. Solan turned away from his companion at the sound of his name. Face breaking into a wide grin, he launched himself from the altar and ran to Xena giving her a huge hug. Gabrielle could only point at the supine figure on the altar in reply. Xena’s gaze followed the wavering arm to rest upon the visage of… Hope. With a strangled cry Xena reached for her sword and charged at the supine figure. She raised the weapon high overhead to deliver a massive blow, but was stopped short by the sudden appearance of Solan between her and her intended target. “That’s right,” Xena spat through gritted teeth. “It would make me feel better,” Xena grumbled, slowly lowering her sword. Solan looked at his mother through eyes more mature than his juvenile features implied. “Mother, everyone I ever knew is dead – ‘sides you and Gabrielle.” He shrugged. Solan cast a glance at Hope before returning his gaze to Xena. “Then I want a friend,” he stated determinedly. “Solan!” all three women cried with varying degrees of shock and outrage. “So?” Solan quipped. “You tried to kill Gabrielle and you’re still together. “She’s changed. I know she has,” Solan cried. “What do you mean?” snapped Xena. “I don’t know…” Gabrielle said. “No. Gabrielle won’t be your link. I will,” Xena insisted. “It’s not about control, Gabrielle. I don’t want you to have to go through that pain again.” With that Xena began forging the chain of power that would tether Hope to both this limbo prison and to Xena herself. Xena and Gabrielle, along with the spirits of Hope and Solan began their search at the Amazon village. Turning to her companions, Hope said, “Xena, if you’re ready?” At Xena’s nod, Hope stepped forward and merged with Xena. “Alright.” The voice was a strange mixture of both Hope and Xena. Hope/Xena closed her eyes and let her senses reach out. After a few moments she nodded and opened her eyes. “This way,” she said, leading the way. Eventually Hope/Xena stopped and said, “Here.” She again closed her eyes and slowly made a lifting motion with her hands. The air started to swirl in front of her. An indistinct mass began to take shape. Instead of clarifying the swirling air became opaque. After several minutes Xena’s body jerked upright then slumped back. Not yet ready to speak Xena merely nodded. Gabrielle looked up at the sound and gasped. Standing in front of her were not one, but two children. The boy was instantly recognizable as Solan. He hurried to Xena and threw his arms around her. The other was a girl with long reddish hair and blue-green eyes. Slowly she came to stand in front of Gabrielle and hesitantly repeated the question, “Mother?” Gabrielle looked down at the girl then up at Xena. “Thank you, Xena,” Hope said. Solan ran over and hugged Hope. Laughing, he took her hand and pulled her toward a small hill. The teens flopped down and basked in the sun. “I think you filtered out much of what was once Dahak, too. Didn’t you?” Hope asked from her perch on the hillside. “Let’s go home.” Each woman took the hand of her child and they faded in a burst of blue and green sparkles.